Recorded as Hardman, Hardeman and Hardiman, this interesting surname is of early medieval English, and sometimes Irish origins. If English it was a nickname which derived from the Olde English pre 7th century words "Hardi", used as a personal name and meaning brave, with the suffix "-man", a friend or companion. It is an example of that sizeable group of early European surnames that were gradually created from nicknames. The nicknames were given in the first instance with reference to a variety of characteristics, such as physical attributes or peculiarities, or to habits of dress and occupation. In Ireland the surname can be of English origins, or may be a developed form of the pre 10th century Gaelic name O' hArgadain composed of the elements O' meaning male descendant of, with "Argadan", a personal name from argad meaning silver. The surname is first recorded in the early half of the 14th century, and early examples taken from surviving church register recordings include those of Thomas Hardiman, who married Agnes Sweet at the church of St. Dunstan's in the East, Stepney, on February 2nd 1601, and that of Elizabeth Hardman who married Edward Barker on November 1st 1638 at St. Martins in the Field, Westminster. A coat of arms granted to the family has the blazon of a silver field, charged with three red chevrons, and a black canton. 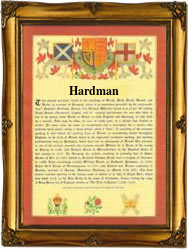 The first recorded spelling of the family name is shown to be that of Walter Hardiman. This was dated 1327, in the Subsidy Rolls of the county of Sussex, during the reign of King Edward 111rd of England, 1327 - 1377. Throughout the centuries, surnames in every country have continued to "develop" often leading to astonishing variants of the original spelling.